So your Mac keeps logging you off automatically? After about 30 minutes? My work iMac, running OS X 10.9.5 Mavericks, kept logging me off after a period of a half hour or so. I would leave my desk for a meeting, say, and come back to find me logged out and all my applications closed. Grindingly frustrating. After lots of searching, I finally found the solution – almost by accident. 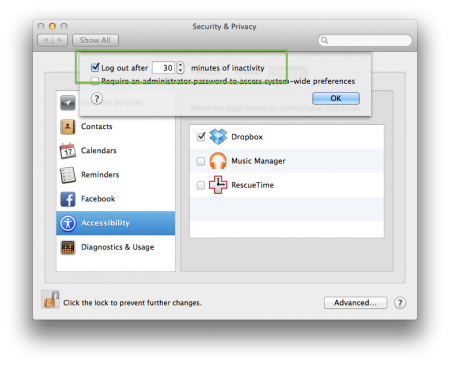 Head to Preferences, and the Security & Privacy pane (above). Go to the fourth tab at the top, “Privacy.” Hit the “Advanced…” button at the bottom of the window. Posted by davelawrence8 at 11:07 am on August 31st, 2015. No comments... » Categories: howto, OS X. Tags: auto log off, disable, imac, log off, log on, mavericks, OS X. Subscribe via RSS. Before the Mac there was no skeuomorphism, because there was no graphical user interface. For almost thirty years the iconography of desktop objects have greeted users as they stare into their computer screens. The desktop metaphor has given new computer users a familiar foundation to ground their experiences upon, and expert users terminology such as “files” and “folders” we still use today. Brushed metal, DVD players, and even the calculator – Brand shows that skeuomorphism is nothing new for Apple. Even the Newton had its share of skeuomorphism, with the lined paper metaphor greeting us in the Notes app. Posted by davelawrence8 at 7:10 am on July 25th, 2012. 2 comments... » Categories: apple, design, macs, OS X. Subscribe via RSS. Yesterday’s Mac trained users on how to navigate the filesystem, while modern operating system like Mac OS X discourage its use. The gap between the abstraction of user space, and system space is widening. As computers become more like appliances the underlying operating system is becoming harder to access. The question – is this a good thing or not? – can largely be answered depending on what type of person you are. I feel Brand’s apprehension about operating systems, with the iOS devices and with the new version of OS X, moving away from the ability to navigate the file system. I’m a folder-and-text-file kind of guy, too. When I got my first OS 9 Mac, it was a joy to dig into the System Folder and poke around at what was in there. This is probably why people ask me to help them work out software and hardware problems at work and at home. My brain is comfortable in a file system environment. But golly, I’m surely in the minority. And so is Brand. We navigate the file system because it brings us the joy of discovery. For most people, they recoil in horror. On Mac OS X Apple has hidden the Hard Drive icon and replaced it with a pre established list of shortcuts that offers speed of access at the price of user confusion. Should I go to the Dock, or the Finder’s sidebar to launch my application or open my file? How about a Spotlight search? With so many possibilities it is no wonder Mac OS X users are often confused about where their files are located. But maybe the problem is that, either way, you’re forcing them to think about a certain file in a certain place in a certain folder. Right now, OS X fails to make that file easy to find, no matter how many UI schemes Apple introduces. People don’t care about where the file is, because they aren’t interested in organization or structure. They just want to work. This is what makes iOS devices so popular: you don’t think about where the file is, you think about which app you’re going to use. And with iOS, apps couldn’t be easier to find. Maybe it’s about expectations. I didn’t expect to go anywhere near the file system when I bought my iPhone. But I bought a Mac expecting that tinkering is a part of its operation. As long as Mac OS X has it both ways, where you have dashboard-style navigation cues for regular folks and the geekiness of the file system for the rest of us, I won’t put up too much of a fight. Posted by davelawrence8 at 7:37 am on January 28th, 2011. 4 comments... » Categories: macs, OS X. Tags: ios, iphone, lion, macintosh, macs, OS X, system folder. Subscribe via RSS. I’ve been trying to put together simple compiler based on NEWT/0 and the DCL to allow at least some sort of text based development. So far my experiments are actually quite successful, and it seems that developing Newton applications with just a text editor is not that impractical. It is in fact easier when it comes down to version control management. Some things are still missing for developing larger apps, like the ability to split the code into multiple source files, and a way to embed resources into the final package, but for simple applications (and even auto parts), we might have a way forward. He’s wrapping up a compiler project, with scraps up on SourceForge right now. Pretty sweet. NEWT/0 is an open source NewtonScript compiler for Windows, Linux, or OS X 10.3 and above. So Köppen’s version will be a compiler for newer versions of OS X. Can’t wait to see it. Posted by davelawrence8 at 3:54 pm on November 24th, 2010. No comments... » Categories: newton, OS X, software. 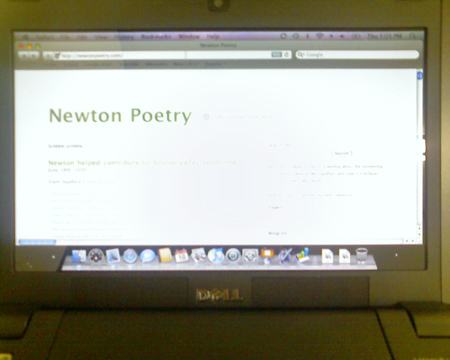 Tags: compiler, Eckhart Köppen, newton, newton OS, newtonscript, newtontalk, OS X. Subscribe via RSS. Mac software geniuses Panic posted some quick little notes about Transmit 4 on their blog, and one of those little ditties was how to customize the icon for each connection. They provide 16 icons to get you started, but also offered a tip on an Iconfactory set. Brasgalla made a whole series of these, some including the best hardware Apple’s made, and they all take you back to the early days of OS X.
I’ve never been a big icon customizer, but playing around with Transmit and setting some custom icons for things like my USB thumb drive and even Automator and AppleScript applications has been a lot of fun. Posted by davelawrence8 at 6:14 am on November 9th, 2010. No comments... » Categories: design, OS X. Tags: aqua, automator, iconfactory, icons, OS X, panic, transmit. Subscribe via RSS. - Sachin’s Posterous, in a very thought-provoking post. I often wonder what OS X+1 will look like. Not OS X 10.7 or 10.8, but after the tens are done. 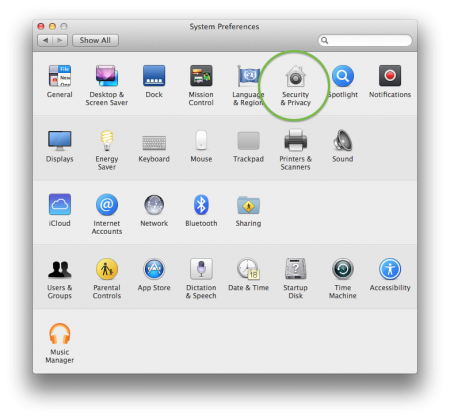 What does the next-generation, non-OS X-based operating system look like? Posted by davelawrence8 at 6:22 am on April 23rd, 2010. 5 comments... » Categories: ipad, OS X. Tags: finder, ipad, iphone, mac, operating system, OS. Subscribe via RSS. Every once in a while, Mac OS X (and OS 8-9) jaggies up a Newton OS .pkg file, rendering the package un-uploadable for apps like NCX. Those little creator codes that have caused a ruckus post-Snow Leopard are partly to blame. That’s where Packager, a Mac OS X app, can come in handy. Packager takes the .pkg file and returns it to its natural, Newton-ready state. Here’s an example. I grabbed an astronomy app called Moon Phase and downloaded the package file (above right). As you can see, it doesn’t look any different from a Keyspan driver installation package (above left). 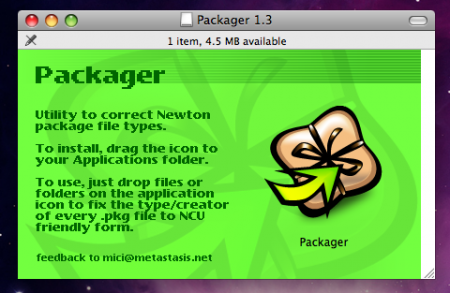 Sometimes, Mac OS X 10.5 doesn’t know what to do with a Newton package file when it’s downloaded (above). This is where you take the file, drop it on Packager’s app icon in your Applications folder, and let it do its magic. 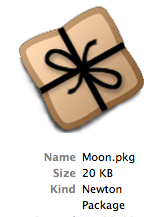 Here’s that Moon Phase package file, post-Packager, but now it’s recognized by NCX and ready to be installed. Michael Vacik, Packager’s developer, released an update last year. He had a site that hosted the app, too, but it appears to be down now. The Packager version on UNNA seems to be version 1.3. For classic Mac users, try Thomas Tempelmann’s Mac PKG Fixer, or PackType (UNNA app package) by Steve Weyer, whose app page is also gone. For WIndows users, try the command-line-operated, dirty-sounding Pkg Stripper by Roger Milne. Posted by davelawrence8 at 7:47 am on December 7th, 2009. 5 comments... » Categories: OS X, software. Subscribe via RSS. Here’s a call out to all my classic Mac using friends. From what I’ve read here and here, it’s not looking good. All the updates Apple threw into OS X 10.6 Snow Leopard, and with the abandonment of PowerPC Macs, things like networking with OS 8 and 9 Macs and AppleTalk have been put out to pasture. I was trying to network my PowerMac G3, running Mac OS 8.6, to my new Snow-Leopard-powered iMac over my Airport hub. No luck, despite some handy how-tos here and here. After a half day spent trying to figure this out, and a bunch of forum list reading, I’ve just about given up. I thought it would be a fun rainy-day project for those with new and old Macs, especially for you, the people, who have OS 9/8 Macs still sitting around collecting dust. Any suggestions, drop me an e-mail. Posted by davelawrence8 at 9:05 pm on November 11th, 2009. 6 comments... » Categories: howto, lowend, macs, OS X. Tags: appletalk, G3, imac, mac, network, OS 9, OS X, powermac, snow leopard. Subscribe via RSS. 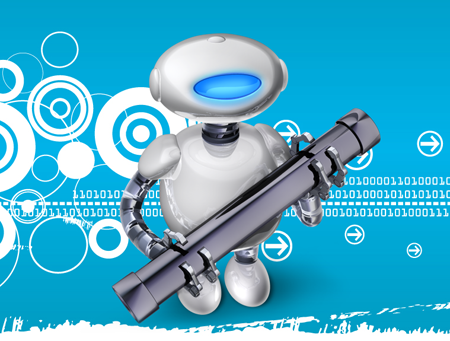 Backup isn’t backup, the saying goes, unless you automate it. Backup experts also say you should keep a second, off-site copy of all of your important materials. If your house burns down, or zombies darken your door, that melted or masticated external hard drive isn’t going to be worth squat. Better to make a backup to a cloud-based system or a drive you keep away from your home. A recent, goofy hard drive glitch got me thinking about both scenarios: the need to make an easy, automatic backup, and the need to archive it to some remote location. Since I don’t have OS X 10.5, with it’s compulsory Time Machine backup system, I needed to make my own backup strategy using the tools at hand on OS X Tiger. So here’s how I used two OS X 10.4 applications, Automator with a dash of iCal, to develop a backup system that fits my needs. Posted by davelawrence8 at 6:35 am on July 13th, 2009. 5 comments... » Categories: backup, howto, OS X. Tags: automator, backup, dropbox, mac, macintosh, OS X. Subscribe via RSS. It was an easy install and it worked *very* well. The little machine reminds me of the days of my PowerBook 100! Now I wonder if you could get NCX running on it and sync a Newton. Anyone tried yet? Posted by davelawrence8 at 6:46 am on June 22nd, 2009. No comments... » Categories: DIY, OS X. Tags: dell, hackintosh, leopard, mini 9, newtmail, OS X, vostro. Subscribe via RSS.